Twenty years ago on February 20th, 1998 the John Curtin Prime Ministerial Library first opened its doors to the public. Built as part of the John Curtin Centre project, this was the first prime ministerial library to be opened in Australia. 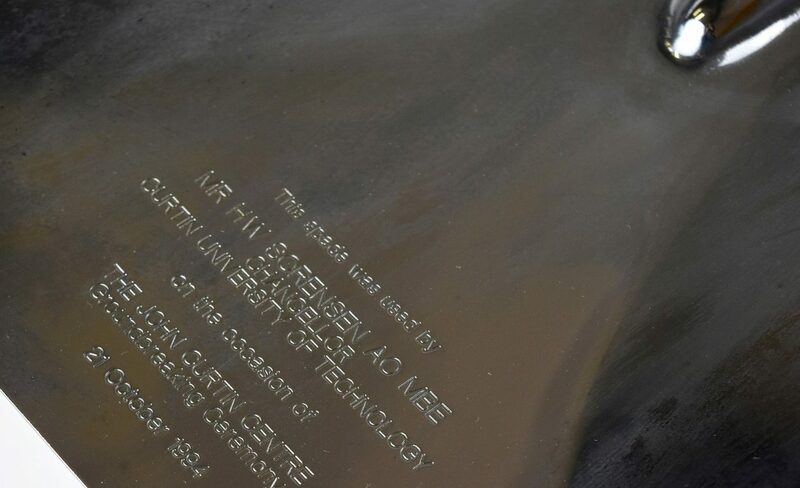 It was the culmination of several years of campaigning, designing and planning. 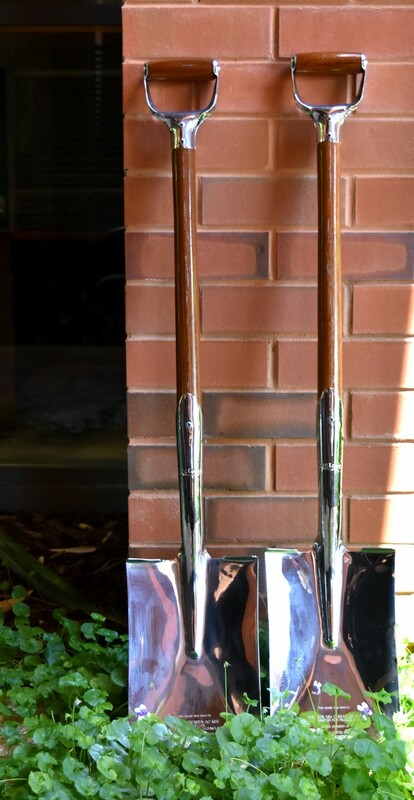 To mark this anniversary we have chosen as Object #42 the spades used at the project ground breaking ceremony on October 21st, 1994. 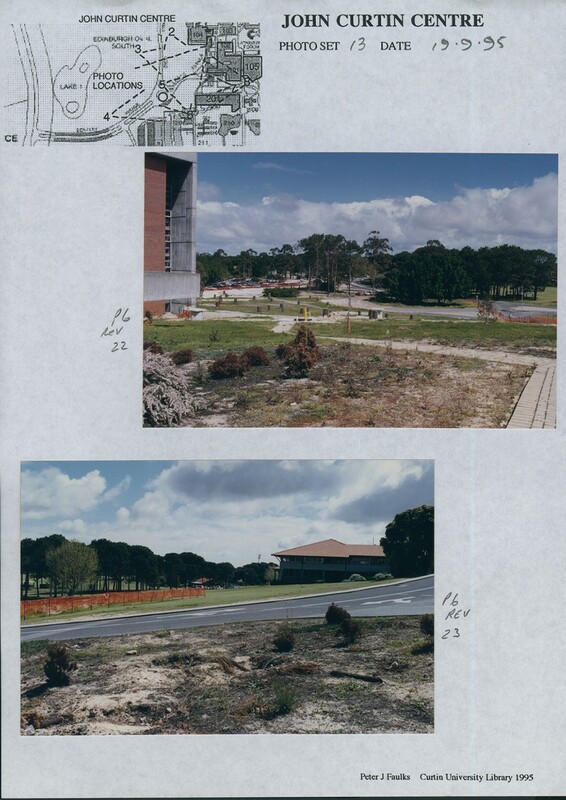 The scheme to construct the John Curtin Centre commenced under the leadership of Vice-Chancellor John Mahoney, with approval ‘in principle’ given by the University Council in May 1989. (Look Ever Forward, p96). The project fundraising committee brought together some prominent West Australians, including Sir Charles Court, Sir Laurence Brodie-Hall, Sir James Cruthers, Hon Kim Beazley MP and Mr John Cowdell. 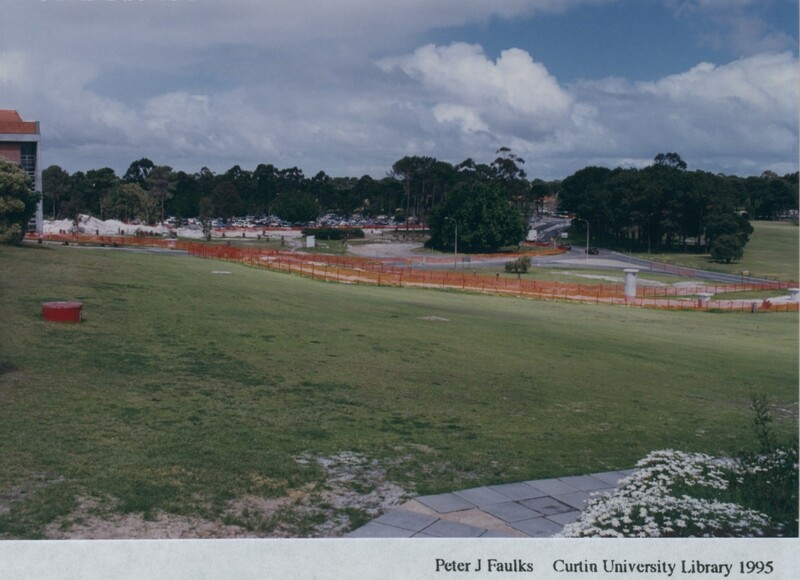 Once the committee had succeeded in gaining pledges of support from both Federal and State governments, several corporations and individuals, the two hectare site on the western side of campus was chosen for the John Curtin Centre. The Centre buildings would accommodate the John Curtin Gallery and John Curtin Prime Ministerial Library together on the south side, with the Chancellery to the north linked by a colonnade (the Whitlam Walk) to the east. 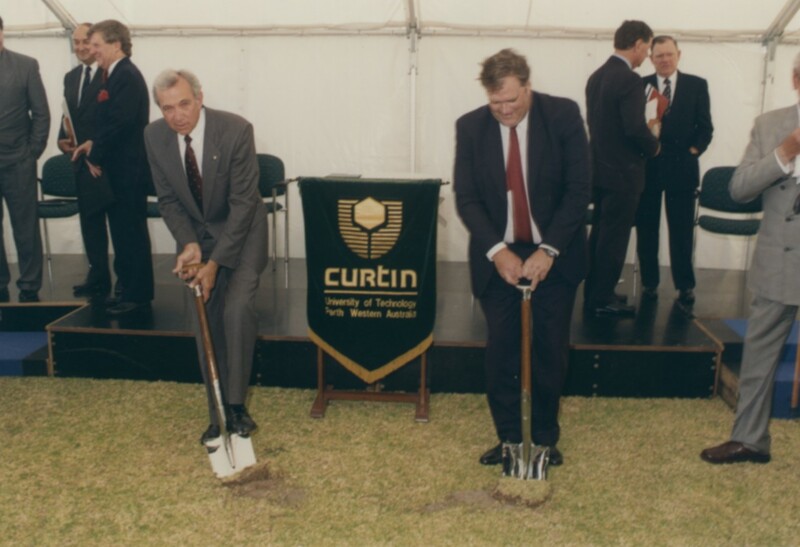 The Ground Breaking Ceremony was held on October 21st, 1994 with the official event taking place under a marquee, where Curtin Chancellor Mr Harry Sorenson, and Hon Kim Beazley MHR each cut the turf with the two spades, now known as JCPML00887/5 & 6. 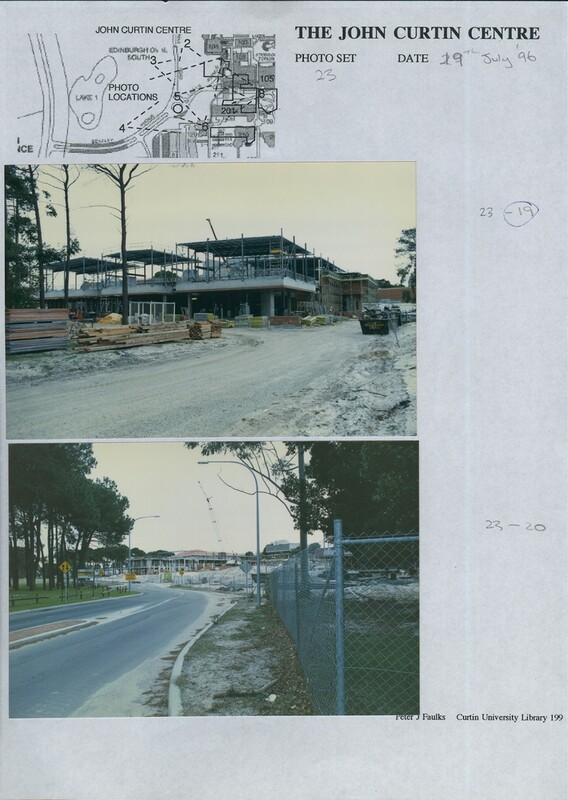 Construction commenced in 1995. Photographs from JCPML00888/1 – 4 Construction Progress Photographs record the vast changes to the landscape on the western side of the campus. 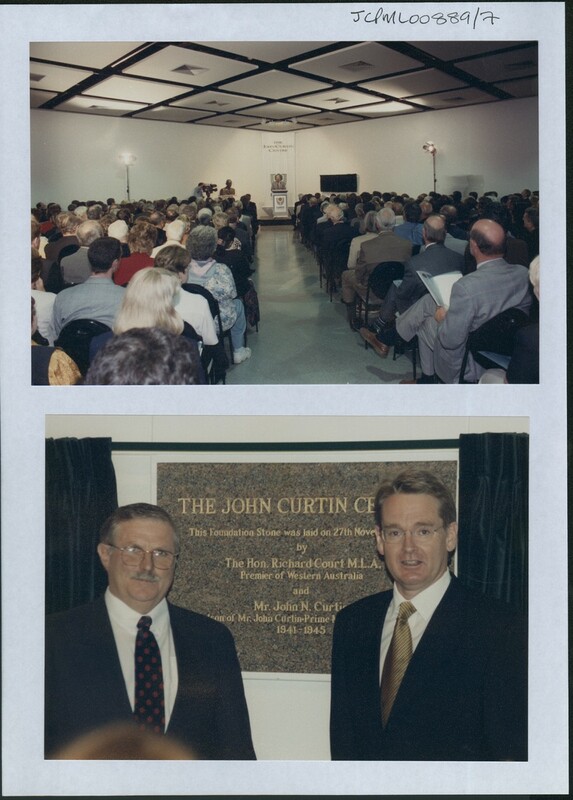 On completion, the John Curtin Centre was formally opened on 27 Nov 1997, when the foundation stone was unveiled by the Premier of Western Australia Richard Court, son of Sir Charles, together with John Curtin, grandson of the University namesake and Prime Minister. Previous Previous post: 41. The Countesse of Pembroke’s Arcadia, 1633. Next Next post: 43. Royal Invitation, State Banquet, 1920.